...it makes me want to come and build an open-cast copper mine here! Not. But that's the kind of thinking that must be going on in the heads of people like the directors of Zambezi Resources Limited (an Australian mining company). They are planning to open an open-cast copper mine in the MIDDLE of the Lower Zambezi National Park in Zambia! The Lower Zambezi National Park lies on the northern banks of the mighty Zambezi river, directly opposite the Mana Pools National Park (which is a UNESCO World Heritage Site). There was a formal, proper EIA done (Environmental Impact Assessment). This EIA strongly recommended that mining does NOT continue in this area. The minister responsible for these decisions in Zambia has recently simply overturned the EIA and the decision not to continue with the project, for no apparent reason (he cites job creation but probably received a fat incentive cheque too). Tourism is the fastest growing economic sector in Zambia, and the one with the most potential for sustainable economic contribution to the country's GDP. 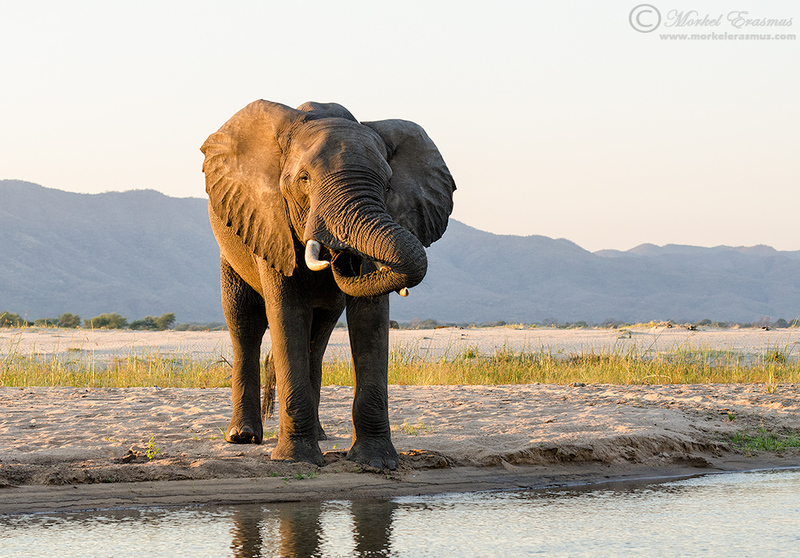 Did I mention that the Lower Zambezi National Park lies on the northern banks of the mighty Zambezi river, directly opposite the Mana Pools National Park (which is a UNESCO World Heritage Site)? The Lower Zambezi National Park is listed to also be given UNESCO World Heritage Site status soon. This will obviously fall flat if the mining continues. The mining company claims this will be the "cleanest, greenest copper mine ever". Have you ever seen open-cast/open-pit mining? Puhleeeze. What a load of hogwash! Any pollution to the ground or surrounding water sources will flow DIRECTLY into the Zambezi, which sustains a myriad of wildlife and human settlements for hundreds of kilometers before it reaches the Indian Ocean in Mozambique. What can we do? Mostly make a noise, spread the word and support our Zambian conservation colleagues in any way possible - believe me they are fighting this thing tooth and nail on the ground. Firstly - check out the "No mining in Lower Zambezi National Park" Facebook page HERE. Join up by liking the page and make sure you stay updated and share important announcements from them to your Facebook network. You can also check out their blog HERE. Secondly - check out the petition they created on Avaaz and sign that, HERE. Greed is going to be the end of Africa, especially with corrupt politicians selling out our natural heritage to make a quick buck. It's sickening. Please have a look at the links I shared and do your part to at least spread awareness of this issue. So ridiculous! Already signed that petition... hope they realise how pathetic it is and how badly would that damage the tourism. They´re damaging themselves! Indeed Miguel, it's an atrocity. Luckily it seems a temporary court injunction has halted this again, pending further investigation. Let's hope it gets canned altogether. Thanks for your comment. Wow that´s a relief! Maybe there´s still hope that they come to their senses and stop this... until then we´ll keep spreading the word! My name is Robert King; I am a wildlife biologist (not in that field now but much past experience in the States). My fledgling site is www.itsaboutnature.net. My primary focus will be to explain nature.......AND TAKE UP THE FIGHT WHEN NECESSARY. YOU GOT A BIG ONE HERE. It is 5A.M. EST. I am in Maine and just came in from shoveling snow since 3:30. Need the exercise :):). As I eat my cereal I cruise my favorite spots on the net. It all centers around nature and wildlife. Your's is near the top now. But I know that you know.......that you are going have to do most of the work to keep the ball rolling on this one. You need to keep pounding this to us. I discovered your plight yesterday, in Naturescapes.net, Conservation, Ethics forum. I become so angry when I read these things that I have to stop just before I release my post onto NSN Conservation, Ethics. I have it in the draft area right now. Today is a very busy day but I will try to get to it today. You need to keep taking the lead on this. Keep telling us. Do not be shy about this. You are doing a good job so far. You have put in a lot of work already. It shows.! You are right........Africa has somehow become at least one of the center stage's in the world wide assault on nature. There is too much to lose here. Mining is one of the most despicable activities against nature.......OF ALL. Yet, you have an economically desperate people who need work. I will try to get back to my draft and finish it and release it on naturescapes.net. YOU WILL NOT BE ALONE! What you said it takes is exactly what it takes. I would have to go back and read it again, but the gist of it is that it takes people who care, networking, getting the word out and digging in their heels. Mining in one of Africa's National Parks?........Not no, but hell no! "blck-shouldered kite" is the name I chose for myself on naturescapes.net. Wildlife is all my life. I love wildlife.